Hezekiah's Tunnel is an absolute must-see for those who like to combine their sightseeing with a real sense of discovery and adventure. 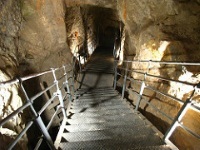 The tunnel, which is about 2,700 years old, was built by King Hezekiah in preparation for an invasion by the Assyrians. His plan was to shut down springs based outside the city, and redirect water through a tunnel under the city walls. In this way, he looked to protect Jerusalem's precious water supply and outlast the invaders. The tunnel is made all the more remarkable when considering its middle section, which zig-zags wildly. It was constructed in this way because two teams of diggers (each operating from a different end of the tunnel) were trying to meet by the sound of the other's picks working against the rock.